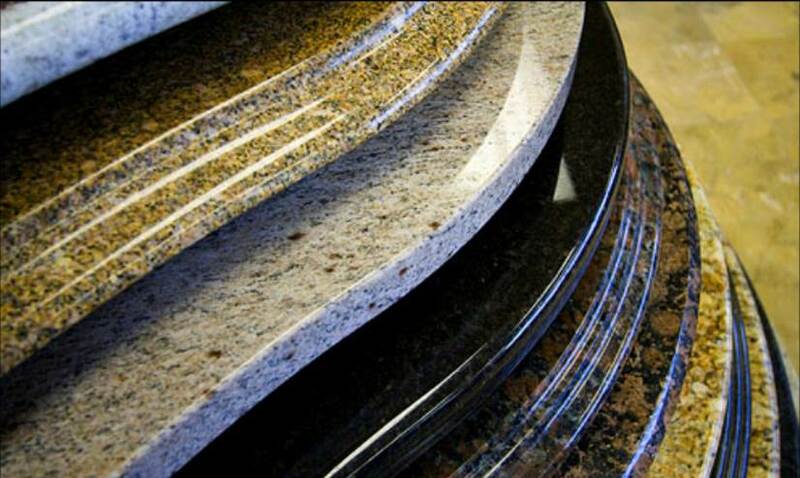 Whether your countertop material is granite, marble, quartz or solid surface the edge profile you choose will have a dramatic effect on the look of your new countertops. Which profile is best? It is really a matter of taste and budget. Countertops generally come in three basic thicknesses, 3 cm (1¼”) 2 cm (3/4”). Solid surface countertops are fabricated from sheets of material that are ½” thick. Solid surface edges that are built up by laminating strips of material together to a finished thickness of 1½.” In some cases stone countertops are also fabricated with laminated edges making them look as though they are 2 ½” thick or more. If you are purchasing 2 cm stone or quartz the height of the edge profile must be kept in mind. Generally speaking, 2 cm material is finished with an eased edge. Tall profiles like a Triple Pencil or a Large Roman Ogee will require laminating additional material to the edge to gain the required thickness. Because granite is composed of different types of minerals and crystal deposits of varying sizes squared edges can chip and spall leaving an edge looking and feeling rough. Eased edges, also called flat-polished will have a 1/8” round over on the top edge. This preserves the clean straight lines that make the edge appealing. The more rounded the edge the more durable it will be. Your fabricator will have a full selection of sample edge profiles available to help you with your choice.